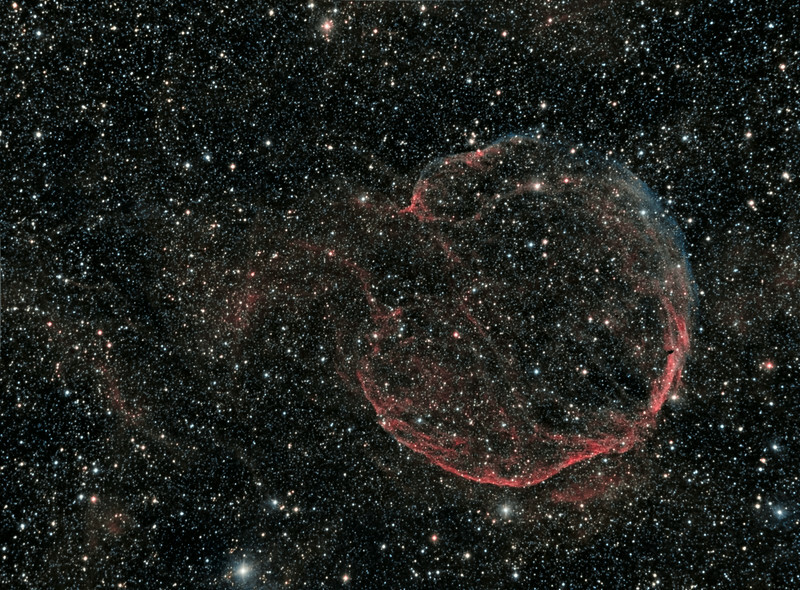 Supernova Remnant Abell 85, CTB-1. TEC 140 @ f 5.3 and FLI ML8300 camera. Ha 15 x 30 minutes bin 1x1, OIII 8 x 30 minutes bin 2x2. Taken by Lynn Hilborn, WhistleStop Obs, Grafton,Ontario on August 4,5,10,2013. Astronomy Magazine Photo of the Day . Reprocessed July 2014. Abell 85, aka CTB 1, or LBN576, is a large supernova remnant (SNR) located in Cassiopeia. Originally catalogued by George Abell as a planetary nebula, it soon became evident that it was actually a SNR. It was also recognized as a radio source and acquired the alternative designation CTB 1. Abell 85 has relatively weak [OIII] and H-Beta emission compared to the "traditional" supernova-remnant lines of H-alpha, [NII], and [SII]. For visual observers, the gain in contrast using [O III] and H-Beta filters appears to be minimal. In fact, this object is often considered as one of the most challenging for visual observation [Ultimate challenges] and remains a good test for CCD photography.